Another Martian romance by the screenwriter of the Bogart-Bacall Big Sleep, and later The Long Goodbye and The Empire Strikes Back. 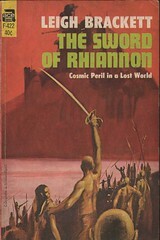 Brian Aldiss, in his essay Billion Year Spree, cites this novel as 'the most magical sub-Burroughs of them all, the best evocation of that fantasy Mars we would all give our sword arm to visit,' and goes on to further distinguish it by quoting a couple of paragraphs from the opening pages. As the story opens, Matt Carse, a sort of interplanetary archaeologist, is walking by night near the low canals of Jekkara, when he's approached by a thief who shows him a remarkable sword - a sword which bears the sign of Rhiannon the Cursed. 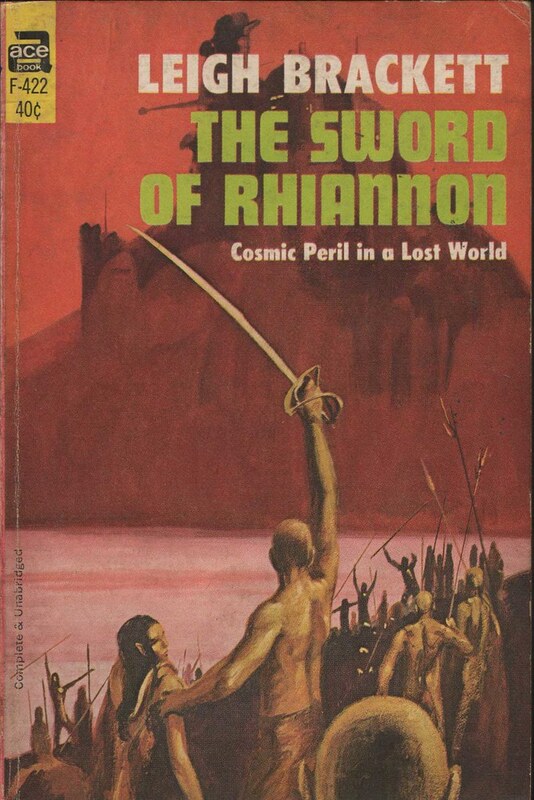 Rhiannon was a god punished by being entombed alive by his peers more than a million years past, for passing on their powerful knowledge to the Martian people. For a million years men have sought the grave of Rhiannon. The thief takes Carse to the grave where he tricks the earthman into falling through a kind of black hole which spews him out into a Mars of a million years before - a Mars where the hills are green and the sea still beats against the land. Society is split into three groups. The people of the Sark coast, which includes Jekkara, who have as their allies the snake people of Caer Dhu - powerful allies indeed, since they'd been Rhiannon's pupils and possess advanced weaponry. Ranged against these two are the human Sea Kings of Khondor with their halfling allies the Sky Folk and the Swimmers. Carse soon gets into trouble and becomes a galley-slave in the company of a fat thief, Boghaz, who is the kind of companion most heroes could do without. Additionally, he's come to realise that he's carrying an unwanted 'passenger' in his own head - Rhiannon himself, who has somehow taken up residence in his mind during the fall through the black hole. The ship is carrying the Princess Ywain of Jekkara - one of Brackett's marvelous little fierce dark-skinned fighting women, not quite like the women of any other world or any other author. The rest of the book relates how Carse battles his way free, encounters the Sea Kings and starts a one-man war with the snake people. And, naturally, falls in love with Ywain. Brackett unashamedly borrows names from Celtic and other myths, but the book owes more to E R Burroughs than to that other rather overworked source. Brackett's writing, though, has a much more intense, and often poignant mood than is found in Burroughs' Martian epics. Brian Aldiss cites this as his favourite Martian fantasy. Brackett's writing is undeniably attractive and always well plotted. Another of her admirers is Michael Moorcock. John Schoenherr contributes a suitably moody cover painting.